Let's imagine that you were to brown six sticks of butter in one week. Hypothetically speaking, you'd watch six creamy blocks of pale yellow fat turn into a hot, bubbly liquid smelling of toasted hazelnuts and caramel. Going out on a limb here, I'm guessing you might start to wonder why we ever use unbrowned butter. Not that I would know. I have so much to tell you about brown butter (and desserts involving said item) that I'm a tad embarrassed. Does she make anything else? (Yes, I promise, she eats greens from time to time.) I'll spare you an onslaught of indulgence by plopping a salad in between, a bit of dietary comic relief so that you can enjoy brown butter and I can enjoy not getting made fun of. So here's brown butter project #2 of the past 7 days: a brown butter banana bread, jacked up with bourbon (Deb made me do it) and plenty of fresh nutmeg. It's basically the recipe for my easiest cake ever, but it has mashed bananas, you bake it in a loaf pan, and it's got enough potassium in it that I proclaim it a very legitimate option for breakfast. Brown butter for breakfast? I'm like the best babysitter ever. 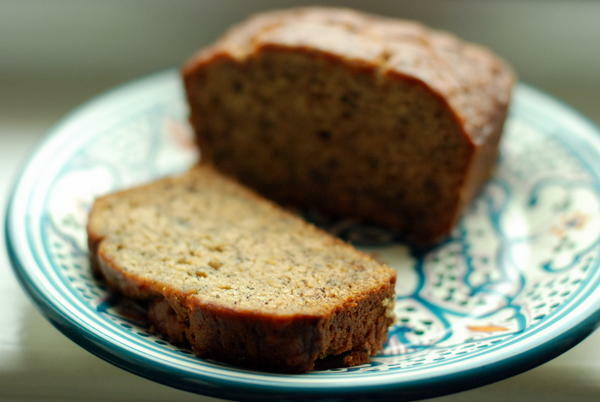 Though I do not love bananas, I do love this banana bread. It tastes like whatever you ate as a child, but way better. Forget the canola oil, the mushy top crust, the strangely dry center. This is perfect. And if you have strong feelings about no banana bread being complete without chocolate chips, well jeez -- whoever said you can't improve on a good thing hasn't tried brown butter chocolate chip banana bread, am I right? Brown Butter Banana Bread adapted from Deb, who adapted it from Elise As much as I love cinnamon, I wanted the nutmeg and brown butter to be heard in this here choir, so I left noisy cinnamon out. Otherwise, it's basically banana bread with brown butter and bourbon. Stuffed my face on it, no big deal. Oh, and hey: dark rum also goes really well, if you're out of bourbon or are feeling tropical. Give it a whirl. Preheat the oven to 350 degrees F. Butter a 9x5 loaf pan or line with parchment paper. Heat butter in a small saucepan over medium heat until butter melts completely. Then reduce heat to medium-low and continue cooking until foam mostly subsides and/or butter has turned golden brown and smells nutty, about 5-7 minutes. Watch carefully to ensure that milk solids don't burn. Remove from the heat and set aside to cool. In a medium mixing bowl, mash bananas with the back of a fork until mostly smooth (a few lumps are okay). Add brown butter and brown sugar, and beat with a fork or whisk until completely combined. Whisk in egg, then vanilla and bourbon/rum, and give the mixture about 60 seconds of whisking to incorporate some air into the mixture. Scrape batter into prepared pan and bake for 50-60 minutes, until a tester inserted into the cake's center comes out clean. Let cool in the pan for 10 minutes, then lift or invert on a rack to cool completely. Serve warm or at room temperature. Ask my colleagues what I did this weekend, and they'll tell you what I told them: relax, relax, relax. And truly, that's what I intended to do. It's been an intense month at work, and I've been looking forward to this labor-day-without-weddings weekend for a long time. I had my sites set on the couch, a couple of movies downloaded on my ipad, and a bag of fantastic coffee beans ready for some pour-over action. Turns out, I'm not so good at relaxing in the traditional sense. Sitting on the couch too long makes me twitch. I start poking around at the tomatoes on the counter, seeing if any is particularly soft and needs cutting. The second peaches in the fridge call my name and I'm up, flipping through cookbooks for that brown-butter cobbler recipe I've been meaning to try. And I can't even blame it all on the last glorious produce of summer. Partly, I'm just a mad woman. At 8 am I'm reading The Kitchn on my ipad, and at 8:15 I'm in the kitchen, mixing up dough. I've been eyeing a version of this loaf for over a year. Leite's Culinaria first posted a recipe for lemon pull-apart bread by Flo Braker, she of best tea cookies on the planet-fame. Those cookies are so good, I'll try pretty much any other recipe she writes. Lemon pull-apart loaf looked like cinnamon buns, minus the cinnamon, minus the bun, if you know what I mean. Doesn't that sound delicious and totally self-explanatory? Lemme try again: it's cinnamon bun dough, cut into squares, brushed with melted butter, sprinkled with lemon delicious stuff, and stacked into a loaf pan. As it bakes, the strips rise up and fan out, so the edges crisp and the sugar and butter caramelize. Now then: delicious, am I right? I made the loaf a couple weeks ago, and I added some chopped rosemary to the lemon-sugar mixture. Definitely a winner. But then I made it again, and this time, I added a bit of cinnamon. Lemon and cinnamon work together to make fruit crisps sing; I figured they'd make a great pair in this bread. Spoiler alert: Not so much. The lemon-cinnamon bread was 100% mediocre. 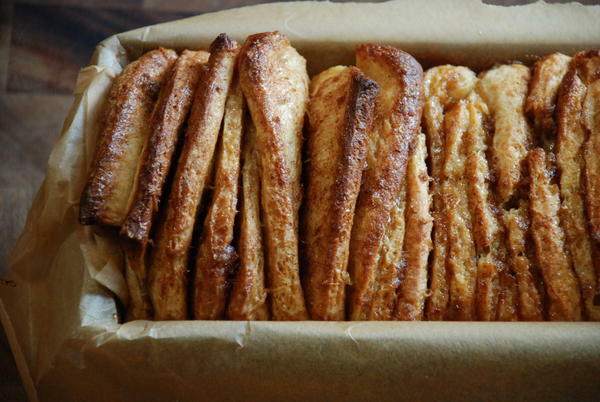 Turns out that what I really craved was the old faithful, cinnamon pull-apart bread. So on try #3, that's what I made. It's every bit as good as it should be, and, if you can believe this to possibly be the case, it doesn't even need the cream cheese frosting. Not that that should stop you. 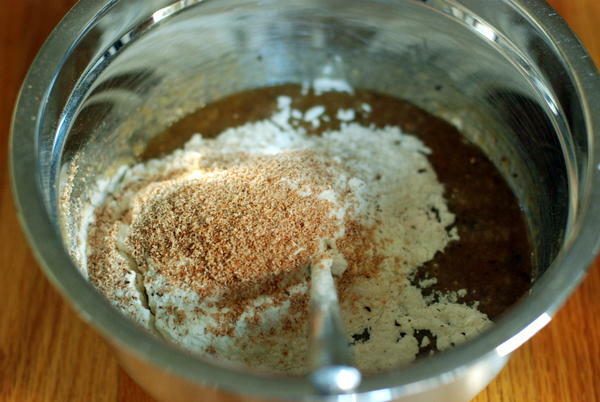 Make the sweet dough:Stir together 2 cups (9 ounces) of the flour, sugar, yeast, and salt in the bowl of a stand mixer. In a small saucepan, heat the milk and butter over low heat just until the butter is melted. (You can also do this in a pyrex bowl in the microwave; the mixture needed about 1 minute in mine.) Remove from the heat, add the water, and set aside until warm, about 1 minute. Add the vanilla extract. Pour the milk mixture over the flour-yeast mixture and mix on low speed until the dry ingredients are evenly moistened. With the mixer still on low speed, add the eggs, 1 at a time, mixing just until incorporated after each addition. Stop the mixer, add 1/2 cup (2 1/4 ounces) flour, and resume mixing on low speed until the dough is smooth, 30 to 45 seconds. Add 2 more tablespoons flour and mix on medium speed until the dough is smooth, soft, and slightly sticky, about 45 seconds. Sprinkle a work surface with 1 tablespoon flour and turn the dough onto the flour. Knead gently until the dough is smooth and no longer sticky, about 1 minute, adding an additional 1 to 2 tablespoons flour only if the dough is unworkably sticky. 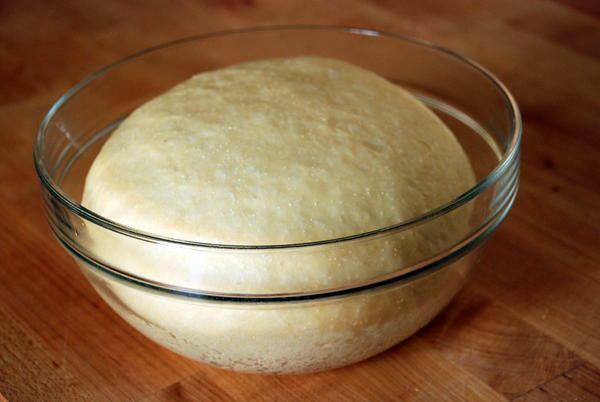 Place the dough in a large bowl, cover the bowl tightly with plastic wrap, and let the dough rise in a warm place (about 70°F) until doubled in size, 45 to 60 minutes. Press the dough gently with a fingertip. If the indentation remains, the dough is ready for the next step. Make the filling: While the dough is rising, mix together in a small bowl either the sugar, lemon zest, and orange zest, or the cinnamon and brown sugar. Set aside. Assemble and bake the cake: Adjust the oven rack to the center position and preheat the oven to 350°F. Line a 9-by-5-by-3-inch loaf pan with parchment using this awesome trick from Alice Medrich: wrap the outside of the pan as if you were wrapping a gift, then take the folded parchment and ease it into the pan. Brilliant! 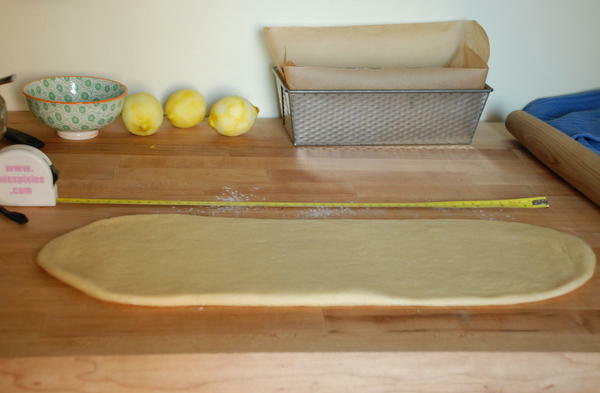 On a lightly floured work surface, roll out the dough into a 20-by-12-inch rectangle. Cut the dough crosswise into 5 strips, each about 12 by 4 inches. (A pizza cutter is helpful here.) 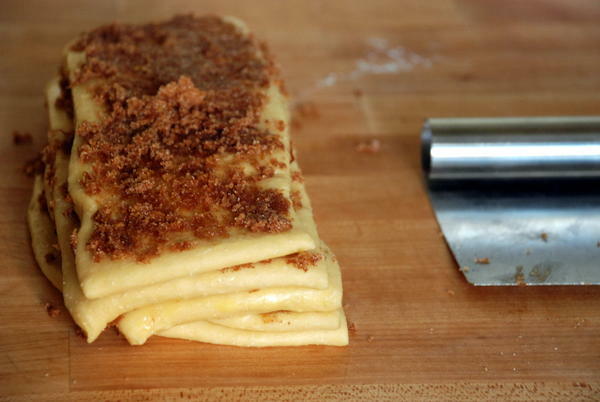 Using a pastry brush, spread the melted butter generously over each strip of dough. Sprinkle 1 1/2 tablespoons of the filling over each rectangle. Then stack the 5 rectangles on top of each other. Work carefully when adding the crumbly zest filling, or it will fall off when you have to lift the stacked pastry later. Slice crosswise through the 5-layer stack to create 6 equal strips, each about 4 by 2 inches. Fit these layered strips into the prepared loaf pan, cut edges up and side by side. (Flo Braker recommends fitting the pieces widthwise in the pan, which creates a taller loaf with lots of room on either side. I opted to stack them widthwise, which was quite tight but rose into a shape I liked more. Your choice.) Loosely cover the pan with plastic wrap and let the dough rise in a warm place (70 °F) until puffy and almost doubled in size, 30 to 50 minutes. Bake the coffee cake until the top is golden brown, 30 to 35 minutes. Transfer to a wire rack and let cool in the pan for 10 to 15 minutes, then remove from the pan. Frost the cake (optional): Combine cream cheese and sugar, and mash/whisk with a fork until fully incorporated. Add milk (and lemon juice, if making lemon bread), and mix vigorously with fork or electric mixer until very smooth. Set cake on the sheet of parchment used for baking, and drizzle with glaze using a fork or brush using a pastry brush. Serve warm. Word to the wise: day-old slices of this bread could use a spin in the toaster, but boy are they amazing post-toast. I'm telling you, it's alive. I've been making this loaf for a few weeks now, tweaking it every so often here and there. It started as a multigrain loaf, with whole wheat and barley and rye all mixed together. I found the flavor a bit muddled, though, and the loaf was too dense. Since I was working with Anson Mills' rye flour, which is fragrant and flavorful and deserves to be celebrated, I simplified the recipe down to some white flour, some rye. Now the loaf is lighter and the rye really comes through. Good rye flour really makes this bread sing, but there are plenty other things to love about it - enough that, were you to make it with whole wheat instead of rye, I think it would still be special. It's got cocoa and cinnamon, cloves and black pepper. Not a lot of any of these, mind you. None really clears its throat to announce its presence. The spices play a supporting role, like the honey in the dough. And they work really nicely with the golden raisins, which give pops of sweetness as you eat. I love a good white sourdough loaf, and I love a good baguette. I adore this corn-filled bread that my friend Jess introduced to me when I visited her and Eli and their beautiful (beautiful!) daughter Mia last year. But this bread, this has become the bread. I start it on Saturday night, then promptly head off to bed. Sunday mornings, before doing all those little Sunday morning things, I fold it on itself a few times and cuddle it up on a tea towel to do its work while I'm out. By midday, we have brown, burnished loaf, ready for a week of toast. The rhythm here is key: Saturday nights are when I feed my sourdough, dutifully dividing the beast in half and feeding it flour and water to make it grow. The unfed half is meant to be used -- in bread, duh -- and mine goes straight into the bowl with spices, raisins, and all the other goodies. If you don't have sourdough, a) come to my house, I'll give you some. Or b) see the instructions below to make this bread without. It's less sour, of course, but really delicious in its own right. A worthy weekend project, if you ask me. This bread lends itself easily to any necessary substitutions. If you don't have or don't want to buy rye flour, use whole wheat. If you don't have sourdough, add 1/2 a teaspoon of yeast, and replace the 8.5 oz starter with 1 cup flour and 1/2 a cup water, added when you add the other flour and water to the dough. In a medium bowl, mix together the starter, water, and honey to make a uniform mixture. Add the dry ingredients and, using a fork or your hand, mix until you have a wet, shaggy dough, about 30 seconds. 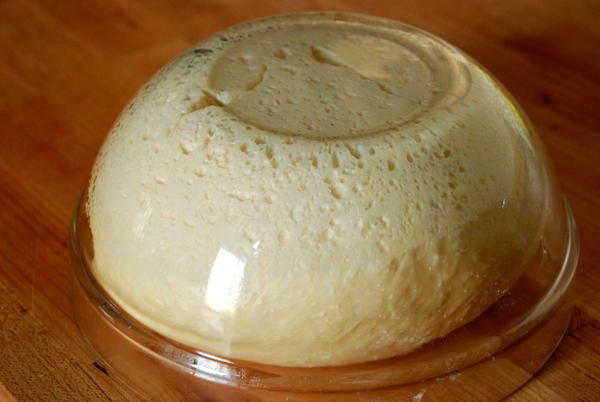 Cover the bowl with plastic wrap or a towel and let sit at room temperature until the surface is dotted with bubbles and the dough is more than doubled in size, 12 to 18 hours. When the first rise is complete, generously dust a work surface with flour. Use a bowl scraper or rubber spatula to scrape the dough out of the bowl in one piece. Using lightly floured hands or a bowl scraper or spatula, lift the edges of the dough in toward the center, folding it into itself. After doing this a few times, tuck in the edges of the dough to make it round. Place a tea towel on your work surface and dust it with semolina, wheat bran, cornmeal, or flour. Gently place the dough on the towel, seam side down. If the dough is tacky, dust the top lightly with wheat bran, cornmeal, or flour. Fold the ends of the tea towel loosely over the dough to cover it and place it in a warm, draft-free spot to rise for 2 hours. The dough is ready when it is almost doubled. If you gently poke it with your finger, it should hold the impression. If it springs back, let it rise for another 15 minutes. Half an hour before the end of the second rise, preheat the oven to 475 degrees F, with a rack in the lower third of the oven. You have two choices for baking this bread. The first is the Jim Lahey method. Preheat a large, covered pot in the oven. When the oven hits 475, use potholders to remove the pot (and uncover it) and then uncover the tea towel and carefully invert the bread into the pot. Cover the pot, transfer to the oven, and bake for 30 minutes. Then uncover the pot and bake another 15 minutes. Use a heatproof spatula or pot holders to gently lift the bread out of the pot and place it on a rack to cool thoroughly. The second method is definitely easier and allows you to make pretty slashes on the top of the bread. Preheat either a pizza stone or a heavy metal baking pan in the oven. If using a pizza stone, flour a peel and put the shaped bread dough on the peel. Make your slashes there, then transfer it from the peel onto the preheated stone. If using a baking pan, make the slashes on the tea towel, then remove the pan from the preheated oven and transfer the slashed dough onto the pan. Either way, bake the bread for 40-45 minutes, until the top is deeply browned but not burned. Transfer to a rack to cool completely. Fresh from the archives, first published October 27, 2007: it's my Ima's challah, with new pictures and better instructions. Enjoy! 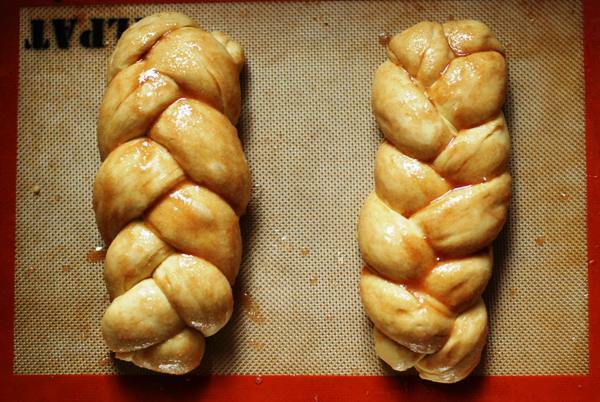 Growing up, there was one option for challah in town. Every Friday, my mom would swing by the local market and pick up two loaves from a nearby kosher bakery. The challah was truly uneventful: it was never dense enough, far too airy, not sweet or eggy, and usually even a bit crumbly. A lame excuse for challah, if you ask me. My mother started making her own around the time I left the house, and she's never gone back. Before she had the kitchenaid, she did it all by hand, which is actually less time-consuming and labor intensive than one might think. Now that she has the stand mixer, though, challah is a snap. 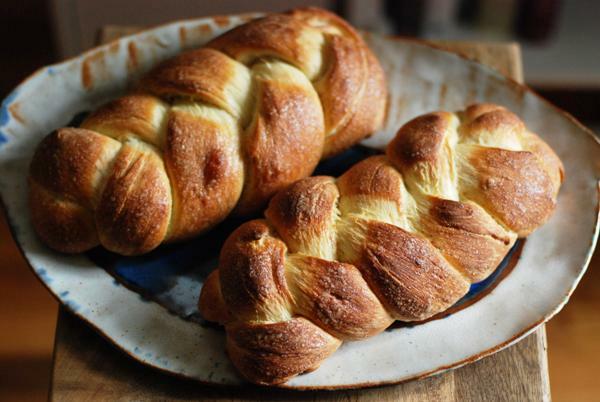 Over the years, I've collected three fantastic recipes for challah. I used to make each with some regularity, but for several years now, I've only been making my mother's. Her basic recipe makes 2 small challot or 1 very large one, which is perfect for me, since I really don't need all that extra bread lying around (not that I would struggle to find things to do with it.... cough cough french toast cough cough). Second, it's just sweet enough without being cloying. Third, it's very easy to substitute some whole wheat flour and wheat gluten for white flour, which makes for a healthier, more rustic loaf of bread. And finally, she's my mom. Moms' recipes are best. A warning about this challah. Back in college, I once brought challah to a meal for 17 people. I made three loaves, in case the first two went quickly. Sure enough, we sat down to dinner and within an instant, both loaves were gone. I offered to bring out the third: "no, no, don't. I couldn't possibly. I have to save room for dinner." Etc. After some more urging, I left well enough alone. After dinner, bellies stuffed, we all migrated over to the couch. I popped into the kitchen to help clean up....and found three girls holding the third challah between them, ripping off big pieces and devouring the loaf as though dinner had never happened. This stuff is addictive. Of course, I've made my tweaks to the recipe. I've settled on substituting whole wheat flour for 1/3 of the flour in the recipe, which gives the challah that rustic quality without sacrificing texture. Because I use a modest amount of whole wheat, I don't add any wheat gluten. I've also taken to making this recipe with melted butter. If you love butter's flavor in pastries and brioche, you'll love it here. And while I'm at it, I've started to use melted butter mixed with cinnamon and sugar to brush the loaves before baking. That makes the challah feel like a truly special treat. Play around; see what you love. 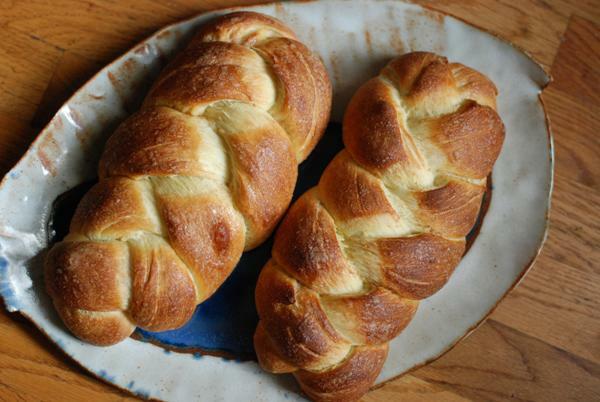 This has been my challah recipe for about 7 years, and I hope it can be yours, too. As I said, lots of options here. Whole wheat, or white (I've offered substitutions for those who want to use whole wheat flour at the end of the recipe); eggwash, or cinnamon-butter; 1 rise, or 2. Do what works for you. Put 1/2 cup warm water in a small bowl. Add the teaspoon of sugar, sprinkle the yeast overtop, and leave it to proof for five minutes. Mix flour, salt, and 1/4 cup 2 tablespoons sugar, and cardamom in a large bowl or in a stand mixer fitted with the paddle attachment. Stir to incorporate or blend on low speed. While yeast is proofing, mix wet ingredients together. Add yeast mixture to the flour, then add wet ingredients to the bowl, and mix using a wooden spoon or fork, or blend on low-medium speed, until the mixture looks uniform. If using a stand mixer, switch to the dough hook and knead the dough for about ten minutes, until everything is well incorporated. Make sure flour at the very bottom of the bowl gets incorporated as well - this may require a bit of mixing and coaxing with your hands. If kneading the dough entirely by hand, turn the dough out onto a floured work surface and begin kneading, adding flour by the tablespoon as necessary, until dough is stretchy but not sticky, about 8-10 minutes. When dough is fully kneaded, transfer it to a large bowl (if using the bowl in which you mixed the bread, you should rinse and dry it first). Cover the dough with a slightly moist towel or a loosely-fitted piece of plastic wrap. Set dough in a warm spot to rise for 45 minutes, until doubled in size. Gently deflate dough, and set aside for another 45-minute rise. Alternatively, let dough rise for 1 hour, until doubled, and then proof the dough for about 25 minutes after it's braided, before baking. I tend to do the latter, since I like to proof it. After the rise(s), the dough should be soft and more flexible than before. Halve dough, then use a dough hook to cut each half into 3 pieces. Roll each piece into a log almost 1-foot long. Braid the logs together to create your loaf. Trick: I start in the middle and do not pinch the top ends together before starting. After I've braided from halfway down to the bottom of the loaf, I turn the loaf over and upside down, and braid the other half. This way, both ends look identical. Tuck the ends beneath the loaf when braiding is finished. Put each loaf on its own lined baking sheet, or side by side on a large baking sheet, leaving at least 2 inches between them. If using the egg for brushing, mix egg and honey to make an egg wash and lightly brush over each of the challot. Alternatively, mix the melted butter, sugar, and cinnamon together and brush that over the challot. Bake at 375 degrees for 20-22 minutes, until challot are golden and baked through. **You can easily substitute up to 50% whole wheat flour, use the same amount as white, but add one tablespoon wheat gluten for every cup of flour. This ensures that the bread will have that same chewy but soft texture as with white flour. You can find wheat gluten at Whole Foods or Trader Joes -- and perhaps at your local supermarket as well. As for which whole wheat flour, my mom recommends King Arthur organic white whole wheat flour: in her words, "it gives the white bread consistency with whole wheat nutrition."